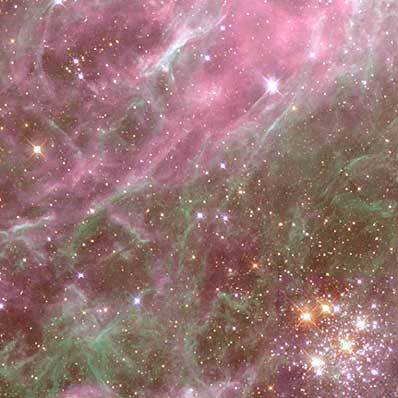 The Tarantula Nebula (30 Doradus). 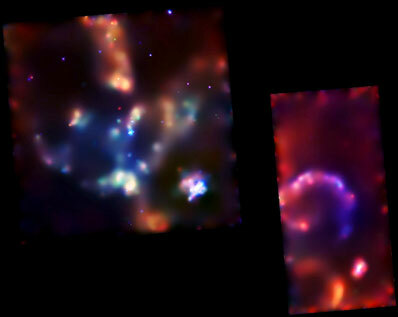 Credit: NASA/CXC/Penn State/L.Townsley et al. 30 Doradus is located about 160,000 light years from Earth in the Large Magellanic Cloud, a satellite galaxy of our Milky Way Galaxy. It allows astronomers to study the details of starbursts - episodes of extremely prolific star formation that play an important role in the evolution of galaxies. In the image, lower energy X-rays appear red, medium energy green and high energy are blue.